How does infection alter animal migration performance? It’s complicated. Animals move around. A lot. Migratory animals are widely assumed to play an important role in the long-distance dispersal of parasites and pathogens. But how does this affect the migratory animals themselves? PhD student Alice Risely, Deakin University, explains how infections might alter animal migration. Migratory animals spread pathogens. But how frequently? And how far? Is it super common for migratory birds to spread pathogens like avian influenza between continents, or exceedingly rare? These were some of the questions that were being thrown around at lab meetings when I first started my PhD in 2014 with Bethany Hoye and Marcel Klaassen. Outbreaks of zoonotic diseases like West Nile Virus, bird flu and Ebola were increasingly in the news, and migratory animals were often suspected of being involved in their dispersal. Yet despite the widespread assumption that migrants frequently spread pathogens, there was surprisingly little direct evidence of confirmed cases. Hence all the questions at lab meetings. Trying to answer these questions seemed like an overwhelming task, especially to an inexperienced PhD student. But we agreed that one really important question that would help untangle the puzzle was: could an infected animal migrate effectively? Long distance migration is very energetically costly, and if an infection lowers migration performance, then this would lower the frequency of migrants spreading pathogens. Even minor infections that may otherwise be asymptomatic may become troublesome when coinciding with such an endurance test as migration. Think trying to run a marathon (or ten) with a cold. The first step we took was to conceptually clarify the ecological mechanisms by which infection could reduce disease dispersal. In what ways could an infection alter migratory performance? And how would this reduce pathogen dispersal? If an infection during migration ends up killing the animal outright, then this would remove the infected individual from the population altogether and, of course, halt parasite dispersal. This process has been termed ‘migratory culling’. But infection can also have sub-lethal effects that manifest in changes to migrant physiology and behaviour. Infection prior to migration may impact migratory fattening and/or reduce a migrant’s movement capacity, and these may coalesce to delay the timing of migration compared to uninfected individuals. This spatio-temporal separation of infected and uninfected individuals is termed ‘migratory separation’. Migratory separation can reduce pathogen dispersal if separation leads to reduced transmission – fewer infected individuals may reduce the chance of the pathogen being able to jump across continents. In addition, delaying migration may also give the migrant time to clear the infection prior to migration. The next step was to try and quantify how infection affected migration. 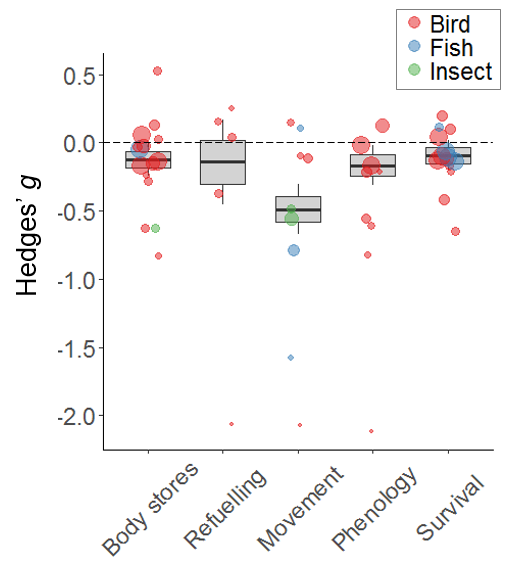 We wanted to know how infection affected each component of migration, including body stores (commonly just called body condition), refuelling rate, movement capacity, migratory timing, and survival. A number of studies had assessed the relationship between infection and migration performance, and we aimed to bring these together to try and get an overall trend by applying a meta-analysis. And not just for birds. Turns out non-birdy species also migrate stunning distances (as an ornithologist, this came as a surprise. Other migrants exist that aren’t birds?! ), and so we included any studies across birds, fish and one insect, the migratory Monarch butterfly, that met our selection criteria. Doing a meta-analysis is tricky for anyone, but it took me, as a new PhD student, a long time to collect the data and work it out. But it was a really satisfying learning curve, and the data and code for the paper can be found here. There were lots of levels of error and pseudo-replication to control for, and we also incorporated host phylogeny into the model. Luckily we had some excellent reviewers who really helped ensure the analyses were as good as they could be (thanks anonymous reviewers!). When we finalized the methods and got our final models, the answers were pretty interesting. There was lots of variation, which was to be expected given the range of pathogen strains and host taxa. We found that infected migrants across species definitely felt the cost of being sick: they tended to be in poorer condition, didn’t travel as far, migrated later, and had lower chances of survival. However, infection affected these traits differently. Movement was hit hardest by infection, but survival was only weakly impacted. Infected migrants may not die as they migrate, but perhaps they restrict long-distance movements to save energy. How does infection impact migratory performance traits? There was a huge amount of variation, but overall the effects were negative. Circles are sized by the sample sizes of the study included, with larger studies having more weight within the meta-model. The intensity of the infection also seemed to be important. Although our sample sizes were quite small for this analysis, there did seem to be a trend for higher intensity infections to be associated with larger negative effects for movement capacity, migratory timing, and survival, highlighting the importance of measuring infection intensity rather than just presence/absence. Some of our results are particularly important to consider for future studies. Many studies we included had relatively small sample sizes (<100), and considering the overall effect sizes we identified were quite small, these smaller studies do not have the statistical power to detect small effects. Small effects are important to detect, because they may still have ecological consequences for large-scale processes such as pathogen dispersal and transmission. We therefore emphasised the importance of ensuring statistical power for future infection studies, in particular for systems where rates of infection may be low. There was also a notable lack of infection studies on migratory mammal species. Considering the renowned migrations of mammals such as ungulates and whales, and evidence of zoonotic transmission my migratory bats, we think these systems will be critical to cover in the future for a fuller understanding of pathogen dispersal and transmission by migratory animals. 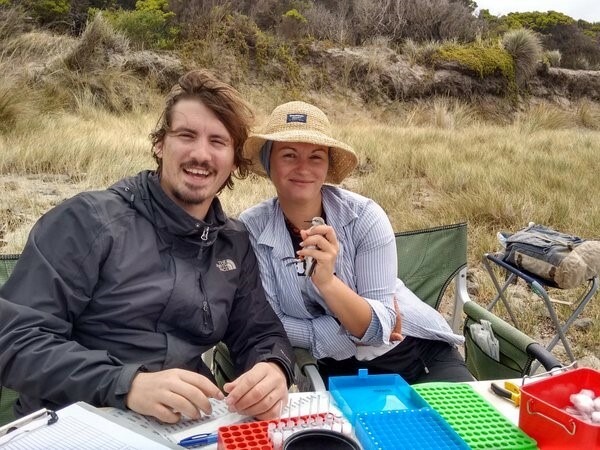 his study was 100% computer based, which is not very visually exciting, so here is me collecting samples from red-necked stint for other chapters of my PhD, and roping in my little bro to help. So, did our research answer all those original questions? Well, not exactly. We still don’t know how frequently animals disperse pathogens long distances. But our research has clarified some of the mechanisms and summarized what we know far, which is important for moving forward. Hopefully with the onset of large-scale tracking studies, we can make even more progress outlining how infection affects migratory movements within individuals and at higher resolutions. Risely, A., Waite, D.W., Ujvari, B., Hoye, B.J. 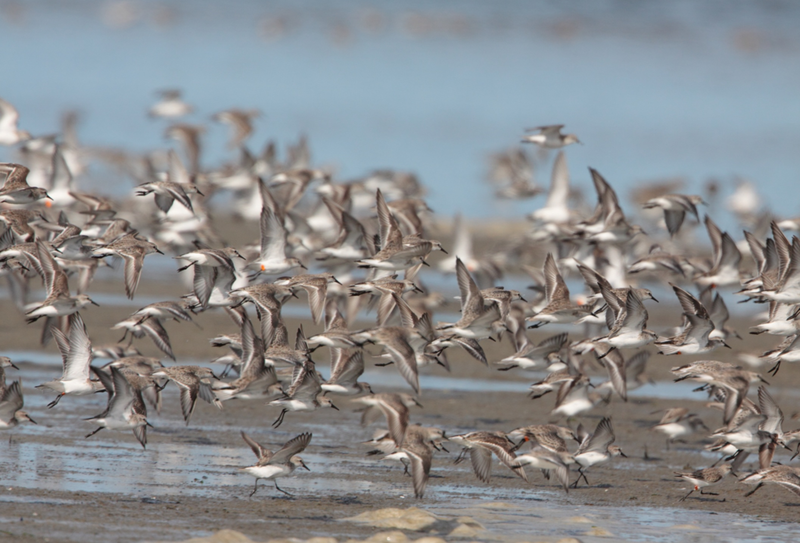 and Klaassen, M. (2018) Active migration is associated with specific and consistent changes to gut microbiota in Calidris shorebirds. Journal of Animal Ecology.